It’s so great to have another FO to blog about, and probably a shock to most of you that I’m posting so soon. Last post was knitting and now for spinning. 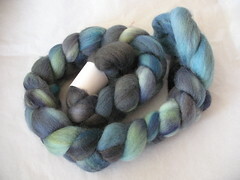 My wonderful friend Micki sent this lovely fiber to me as a “welcome to spinning” gift. I loved it when I saw it and loved it even more while I was spinning it. Spinning thin singles doesn’t seem to be a problem for me, so I did attempt to spin these singles a bit thicker, but staying consistent was more difficult than I thought it would be. Unfortunately there were some thin and thick spots throughout both bobbins of singles and I hoped plying would hide the flaws. This is the first time I’ve spun yarn that when plied, gives a barberpole-like effect. If I would’ve known what I was doing, I probably could’ve split the fiber in a better way as to not have the same colored single occasionally end up plied together, but this is all a learning experience so it’s not like I’m disappointed. I think it looks pretty good for my fourth handspun skein of yarn. After plying I checked the wpi (wraps per inch) and it was 18. After I washed, thwacked and hung the yarn to dry, it bloomed and ended up at 16 wpi. 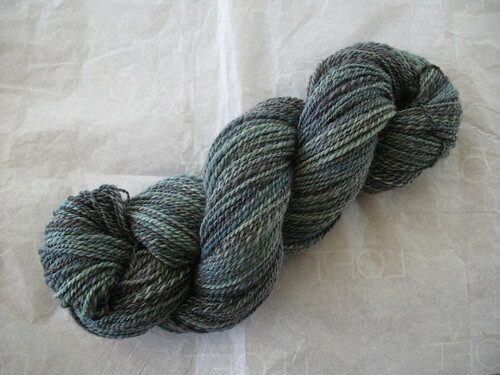 Thus far, this is my favorite skein of handspun. I checked my Ravelry queue, and I think I’m going to make the Morning Surf Scarf featured in the current issue of Spin-Off magazine. I found another Raveler who knit the pattern in sport weight yarn casting on 26 sts with a size 3.25mm needle and only used 200 yards. 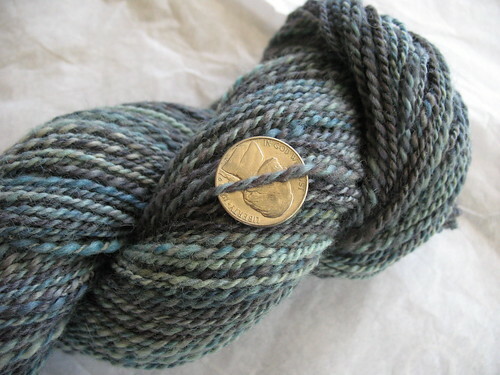 I wonder if I cast on 36 sts if I’ll need more than the 276 yards that this skein has. Does anyone know how to calculate that or do I just jump right in and cross my fingers? My latest yarn collecting came way by means of a contest. I don’t enter blog contests nearly as much as I used to, but this one caught my eye since it was for a skein of Wollemeise. I’ve repeatedly stalked The Loopy Ewe website during the “sneak-ups” to get my hands on some, but it’s all sold out by the time I get there. 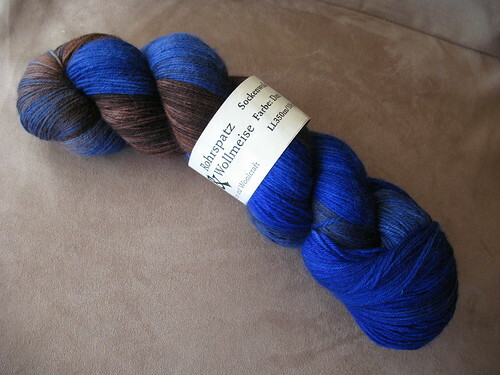 Thankfully Emma came to the rescue and put a skein of Wollmeise up as a prize for her blog contest and lucky me, I won. I am ashamed at how jealous I am of your skein of Wollmeise. Your handspun is gorgeous! It looks like weathered granite. I am so impressed with your handspun! Beautiful work! Congrats on the Wollmeise… that’s a prized aquisition to be sure! Pretty good? Your handspun looks wonderful! I think that the morning surf scarf would be a perfect fit for the yarn. Beautiful!! – I love the subtle shades. 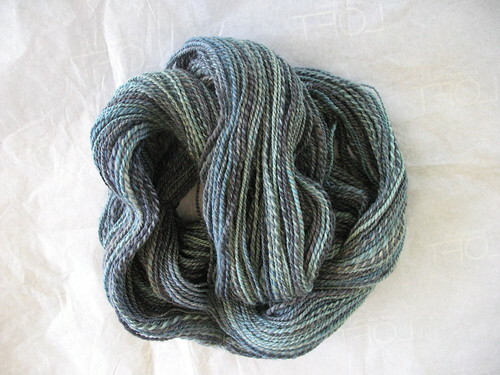 That is some beautiful handspun! The barberpoling is there, but it’s subtle. How did you like working with the PigeonRoof Studios fiber? Your handspun is awesome! It looks like there’s plenty of barberpoling in it. It will knit up into subtle stripey goodness. I have been wanting some Wollmeise also! Lucky you! Your handspun yarn is gorgeous. I am amazed at how talented you are at it – well, not amazed that you are talented, but amazed that you can spin so well in such a short amount of time! It took me forever to get my spinning even. Can’t wait to see how the scarf turns out! Your handspun is awesome! It’ll make a beautiful scarf. Congrats on winning the Wollmeise. Lucky you! Kristie, OMG your handspun is wonderful. After holding it last night I didn’t want to give it back! It is hard to believe that you are a newbie spinner. Atta girl! It’s beautiful! We passed a spinning shop over the weekend, and I really wanted to stop and look at wheels, but the in-laws were in tow, and that wouldn’t have been much fun. I’ll have to check out that Wollmeise – looks lovely! Your handspun is absolutely stunning!! I love pigeonroof colors too! Lucky you on the Wollmeise! And such a pretty pretty color too! That spinning is beautiful – definitely my fav so far! You turned that beautiful “Welcome to Spinning” gift into a beautiful skein of yarn. I think it’ll be perfect for that scarf.